As a business, billing statements are an important part of everyday life. They allow you to charge your customer for sales or services that were rendered. This billing statement template will help you create a professional billing statement in a way that is simple and easy to do. When receiving regular payments from a customer, a billing statement helps to keep things organized. A billing statement can also be used as an accounts receivable ledger for each specific customer, as it show the individual transactions that have taken place and the current balance. 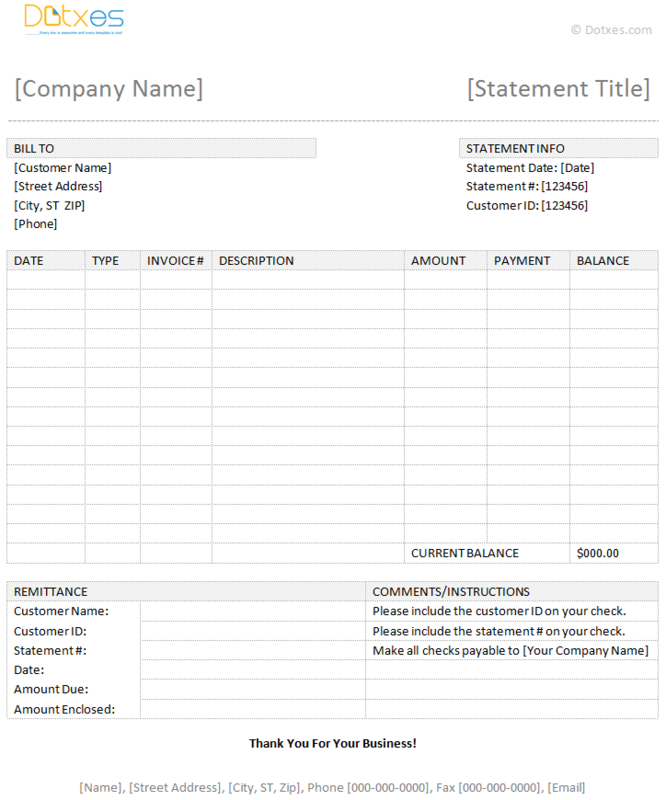 This billing statement template can work as a simple alternative to other small business billing applications and software. With the help of this template, you can track a customer’s account balance, invoices, and payments. This template can also be used for creating a mail-able statement for your customer, to indicate the balance that they owe in a quick and easy way. Unlike other billing statement apps and software, this billing statement template is not automated, but it is made with a professional look that is ready to go. This template does not require you to be an expert at Microsoft Word, all you need to do is open the document and update the provided fields with your customer’s information. When sending a statement to a customer, do not send it in Microsoft Word. Instead, either print the document or send it as a PDF file. If printing hard copies, print and send two copies to the customer, so that they can keep one and send one back with their check. Also, your customer will appreciate it if you include a return envelope that is printed with your address. It’s a simple yet effective template and it’s for free. Love it! Thank you so much!